microfiber dust mop is suggested. ends and sewn tail band is suggested. formulated specifically for stone surfaces. It does not contain    maintenance. Used for heavier build-up of soil, especially greasy or oily soils,   but do not allow solution to dry on the floor. when more than routine cleaning is required. 4. Grout lines may need to be agitated with a grout brush. aged by splashes or spills. places. Dilution should be adjusted according to the degree of soiling. protecting the surface. 1. Sweep or vacuum floor to remove particle soils. An untreated microfiber dust mop is suggested. 2. Protect surfaces not being sealed. 3. For stone floors or porous tiles, apply an even coat of Spinergy Solidrock using a slightly damp rayon mop, a roller or sprayer. to help you in this task. Any sealer that gets on the tile should be wiped off before it dries. white pad. This will remove excess sealer and polish the tile. 4. An optional second coat may be applied to porous stone after the first coat has dried. removing a microscopic layer of the grout. 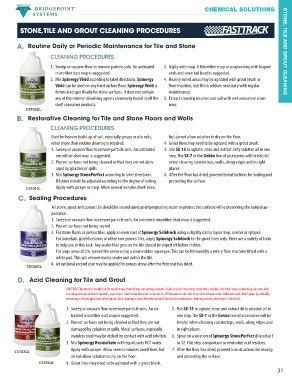 Acid cleaning is most effective when it follows the restorative cleaning process described in Section B.
damaged by splashes or spills. Metal surfaces, especially   in tight places. 3. Mix Spinergy Resuscitate with equal parts HOT water. to 32. This step is important to neutralize acid residues. do not allow solution to dry on the floor. and protecting the surface. CST01GL    4. Grout lines may need to be agitated with a grout brush.